Comet 211482A - 7/8" Steel insert, wedge puck for ribbed cover Duster 94C (High Load). Home > Comet Clutches and Parts > Comet 211493A. MODEL 94C, 30mm Bore Comet Duster Drive Clutch > Comet 211482A - 7/8" Steel insert, wedge puck for ribbed cover Duster 94C. Comet 211482A - 7/8" Steel insert, wedge puck for ribbed cover Duster, 94C Puck, Sold as “3 pack”. Comet Industries 211482-A. 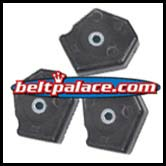 Kit contains Qty (3) Comet 7/8" Steel insert wedge pucks. Use with Comet 94C Ribbed Cover (#211489A). Driver Mod kit 211482-A. For use with Comet 94C-Ribbed Cover/High Load Series Centrifugal Clutch drive systems. 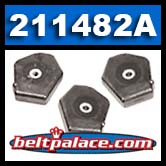 Genuine Comet 211482A 7/8" Steel insert, wedge puck for use with Ribbed Cover 211489A. Made in USA by Comet Industries. Comet 211483A Puck Kit for Ribbed Cover 94C Duster. Sold as a package of (3). Replaces OEM Comet KIT-WDG WGT 1 INS BLACK. Genuine Comet Industries part made in USA. Comet 211493A. MODEL 94C Comet Duster Drive Clutch, Metric 1:10 tapered, 30mm Bore.